THIS BIBLE CODE LOTTERY WIN IS FOR PASTOR HARRY AND FRIENDS TO START PHASE ONE OF RESTORING JESUS LOST CHURCH, BASED UPON JESUS AS "THE CHRIST, THE SON OF THE LIVING GOD"... NOT THE FALSE ROMAN TRINITY OF 325 AD. MAY 1982:GOD SHOWED ME THE PROPHECY OF THE CHURCH OF PHILADELPHIA AND TWO RAPTURES WHICH I WROTE AND PUBLISHED IN A 1986 BOOK, "THE ANSWER-TWO RAPTURES. JUNE 6 2006- GOD LED ME TO WRITE AND PUBLISH, "JUNE 6 2006- ANTICHRIST-REVEALED" WHERE I REVEAL THE NAME, IDENTITY AND PLAN OF THE ANTICHRIST, THE BEAST OF REV:13. 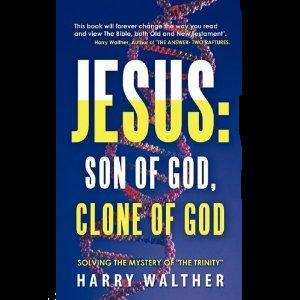 JANUARY 2011... GOD LED ME TO WRITE AND PUBLISH, "JESUS, SON OF GOD- CLONE OF GOD" WHICH SOLVES THE MYSTERY OF THE "TRINITY" AND PROVES THAT JESUS IS THE "SON OF GOD"= BROUGHT-INTO-EXISTANCE BY GOD ALONE. CHURCH TO BE RAPTURED INTo HEAVEN. 6) AT LEAST 144,000 BELIEVERS WILL BE "ACCOUNTED WORTHY" TO ESCAPE 666 AND THEN CHAOS WILL EXPLODE... ANTICHRIST WILL COME AND THE APOCALYPSE SHALL BEGIN. FOLLOW THE VERSES = LUKE: 21:34-36 = MATT:24:40-44 = REV:3:10. (MINIMUM) WILL BE WORTHY AND TAKEN IN THE FIRST OF TWO RAPTURES. TO LEAVE THESE DEAD CHURCHES- AND FEW ARE RESPONDING? LOTTERY WIN- RESPITE- 144,000- RAPTURE. THIS BIBLE CODE SHOWS US TWO PATHS AS 2016 IS ABOUT TO BEGIN: LOTTERY WIN- RESPITE FOR US TO START A REAL, PHYSICAL, CHURCH OF PHILADELPHIA- BASED UPON JESUS AS THE "SON OF GOD" AND NOT THE FALSE, ROMAN "TRINITY"...OR WORLD EVENTS WILL SPIN OUT OF CONTROL AND TRIGGER THE FIRST OF TWO RAPTURES AND THE APOCALYPSE. WE DID NOT WIN THE $1.5 BILLION DOLLAR POWERBALL. AS I WAS INTERPRETING THIS CODE AND OTHER CODES, I SAW TWO PATHS: LOTTERY-RESPITE OR RAPTURE-APOCALYPSE. BUT WHEN I PRAY ABOUT THIS AND LOOK DEEPER, "TWO PATHS" MAY NOT BE THE CORRECT INTERPRETATION OF THIS BIBLE CODE.... ARE THERE 144,000 WORTHY & TRUE CHRISTIANS READY TO BE RAPTURED? ACCORDING TO JESUS' DEFINITION OF HIS "TRUE CHURCH", THERE MAY ONLY BE 7000 TRUE FOLLOWERS OR 700 OR EVEN LESS? CONSENSUS: WHEN I READ WHAT JESUS TAUGHT ABOUT HIS TRUE CHURCH IN (MATT:16:16-18) AND WHAT JESUS SAID ABOUT THE WORTHY, "CHURCH OF PHILADELPHIA" IN (REV:3:7-10)... IT TRULY SEEMS THAT WE MUST AND WILL WIN A MEGA LOTTERY IN 2016 AND RE-START JESUS' LOST CHURCH IN ORDER FOR BIBLE PROPHECY AND THE BOOK OF REVELATION TO BE FULFILLED. COPYRIGHT © 2002-2014 HARRY WALTHER & SATANSRAPTURE.COM ALL RIGHTS RESERVED and COPYRIGHT © 1997-2014, HARRY WALTHER & ESCAPE 666 BIBLE PROPHECY REVEALED, All Rights Reserved.